Although I am a mountain dog by nature, I have enjoyed the Texas coast since moving to the area. My family has taken me several times to Sunny Beach, about 3.5 miles past 61st Street on Galveston Island. This spot isn’t as popular as those closer to the State beach, so it is more quiet. My humans like that…no boom, boom, boom of music. I especially appreciate that dogs are allowed, on leash, and that we can park pretty close to the beach. No vehicles are allowed on the beach, though; you must walk in. Sunny Beach is free (let me hear some OW-woofs!) and kept mostly natural, with piles of seaweed pushed off to the side, creating a little bluff. I love that stuff! Wildflowers are already growing in the seaweed; nature at its best. Many folks seem to visit to fish from the shore, but most are just enjoying a stroll on the beach, or sitting soaking up the sun. I like to run in the sand and sniff all the unique scents that wash up on the shore. Many things had washed up the day of our outing. My humans may not like them, but they are little treasures to me…all interesting to consider. Did that shoe fall overboard, or did a swimmer lose it? And if a swimmer, why were they wearing shoes? I wonder if a Nike® tastes different than an Adidas®? I digress; but hey, I am a dog! On a hot day, wave jumping is a must! The water is so pleasantly warm, how could I not go in? Since I didn’t grow up with waves, I am glad they are relatively small. This is good for doggies my size, and for young humans. Bigger dogs can swim quite a ways out. My humans assure me that the water doesn’t get very deep, but I’ll stick to the shallow waters, thank you very much. 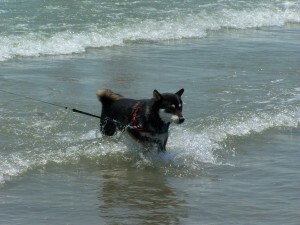 Since I am a Shiba Inu, I am fussy about getting water in my ears or on my tail. Don’t judge me…that’s my breed. 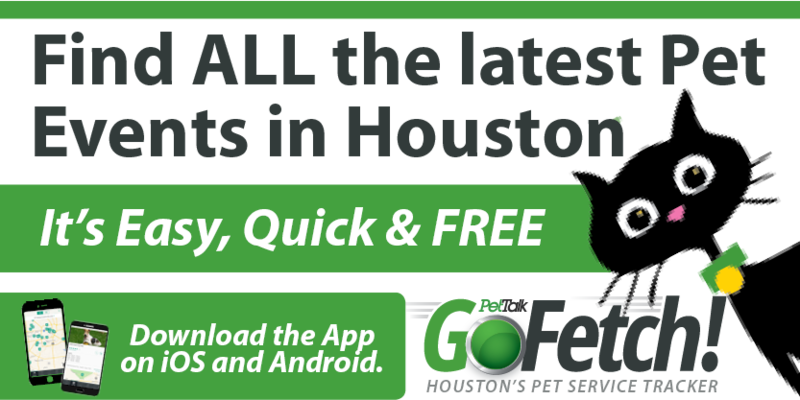 Your humans will want to bring plenty of fresh water for you to drink. 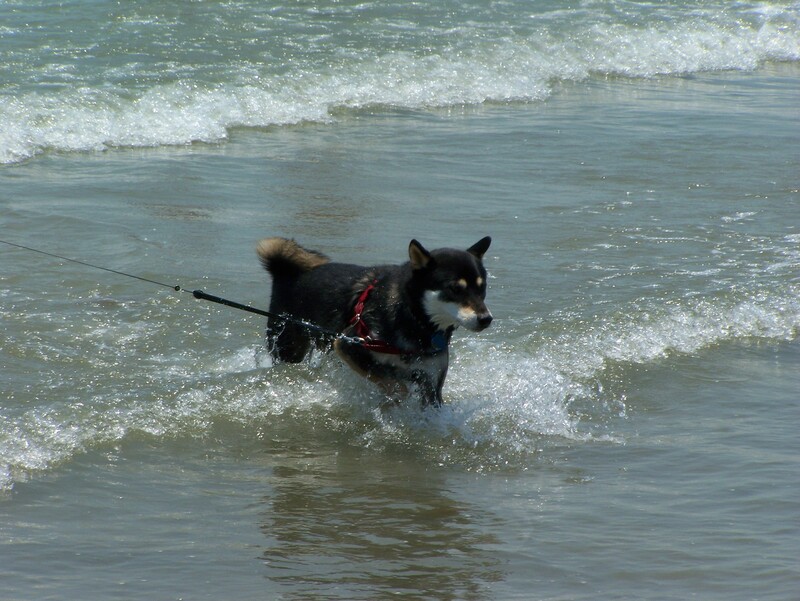 The ocean water is too salty…bleck. I hear ocean water can actually be very dangerous for dogs, so listen to your humans and drink fresh water only. If your family plans to spend the entire day at the beach, shade is important to prevent overheating. My humans put a stake into the ground and hook me to it. That way, I can move about freely but still be tethered. Remember, being on leash is the law. And “poop” happens, so your humans will need baggies to clean up. The beach has tons of garbage cans available. Sunny Beach is nearby and easy to get to. You don’t have to dedicate an entire day if you don’t want to. The beach blends into others, and you can go quite far if time and energy permit. Texans sure are friendly folks. We always end up stopping to meet new dogs and humans. I am very polite, sniffing and swirling. Perhaps I will see you someday at the beach! I am the extremely adorable, cute and amazing Shiba Inu with the curly tail…and tall humans.